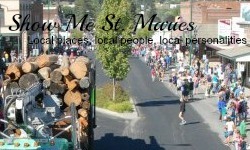 Residents are invited to take a stroll through time and learn about the early days of medicine in Benewah County. 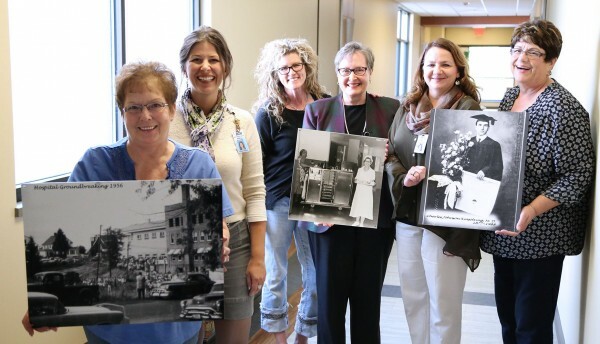 A group of seven volunteers, at the request of the board of Benewah Community Hospital, put together a display of more than 150 historical photographs to be unveiled at 9 a.m. Saturday, Sept. 27. The unveiling is being held in conjunction with the Community Health Fair, which is from 7 to 11 a.m.
Judy Bailey, Polly Grasham, Robin Renaldo, Colleen Smith, Debbie Flach and Marie Ross display a few of the pictures to hung in the hallway at Benewah Communtiy Hospital. The women, along withJeannie Johnson, completed a historic exhibit of pictures and stories, which will be unveiled at 9 a.m. Saturday. The display, entitled “A Walk Through History: Enjoy the Journey,” is located in the hallway that connects the new hospital tower that was completed in 2013 to the main entrance on Eighth Street. Marie Ross added that a group of individuals approached the hospital board about doing a project on the history of medicine in the county. The three women, along with Robin Renaldo, Judy Bailey, Colleen Smith and Jeannie Johnson, began to glean information from longtime employees of Benewah Community Hospital, review books written about the area, sought out archived photos, reviewed old issues of the Gazette Record and more. “The discovery of the history was amazing,” Ms. Flach said. Ms. Ross said there was “a ton of information” to be reviewed. She added it was fun to hear different stories. “Not many people will recall that there were clinics up Marble Creek at one time,” she said. Photographs and information were reproduced on aluminum wall panels to be hung in the hallway. “They reproduced really nicely,” Ms. Renaldo said. Relatives of Dr. Barney Rapp and Dr. Larry Kinsolving will have the honor of cutting the ribbon at the unveiling ceremony Saturday. Dr. Rapp worked in medicine in Benewah County for more than 50 years. Dr. Kinsolving, Ms. Renaldo said, was one of the first doctors to work in the area. After the ribbon cutting ceremony, individuals will be able to take time looking through the many photographs and reading the information the women gathered for the display. Ms. Grasham said the exhibit will continue to accept new photographs. “We are anticipating collecting more as more stuff comes in,” she said. “We know we probably missed some stuff,” Ms. Renaldo added. Ms. Grasham said information about submitting photographs and information for the display will be available at the unveiling Saturday.